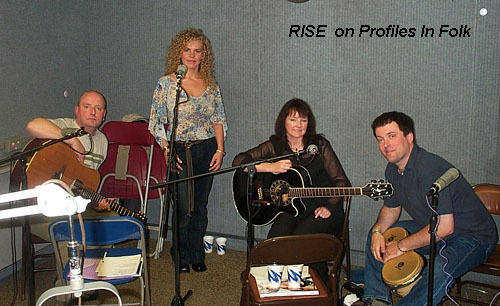 This night was a real treat for listeners the band Rise from the Isle of Bute, Scotland, live in our Studio A at WSHU (with Paul Litwinovich doing the engineering, of course). For several months, we have been playing selections from their album Uncertain Wonders, but to have them here live was a true delight. The band Debbie Dawson, Elaine McCombe, Gerry Geohegan and Kris Manvell spent about 75 minutes with us before we had to get them on the road (for a long late night drive to Long Island). They spent nearly two weeks in America visiting radio stations and folk and acoustic music presenters. We used their time with us to talk about everything from the bands evolution and their music to the Scottish folk scene and Robert Burns, Caledonias Bard and to hear their music live. After their departure, we programmed selections from two new albums by Scottish bands and then welcomed my son, Matt Winters, host of two programs at WKCR-FM in New York City, for a short discussion of John Wesley Harding, scheduled to make his Bridgeport debut the next night. Listen to The Entire show, October 11th.